Michigan and Ohio State fans, please return your seat backs to their full, upright and locked position. Seems as if the powers-that-be have been working diligently to put and end the traditional season finale between Michigan, and that school from mid-Ohio. Thus, ending one of the greatest rivalry traditions in all of college football. Well, maybe not purposefully ending it, but drastically changing it by splitting Michigan and Ohio State into two separate Big Ten divisions come 2011. 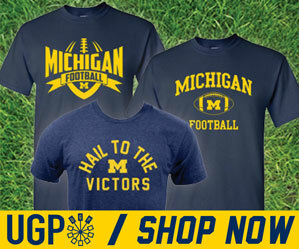 Greg from MVictors has the bullet points from Michigan AD Dave Brandon's morning chat with Sam and Ira on WTKA today. You can download an MP3 of the audio here. When asked if he were making the decision, would he put Michigan and Ohio State in the same conference division? Brandon paused then answered. "No." Sam asked, "Why?" Brandon: "Because we’re in a situation where one of the best things that could happen, in my opinion in a given season, would be the opportunity to play Ohio State twice. Once in the regular season and once for the championship of the Big Ten. Sam asked about whether they would hold the tradition to keep that the last game of the season. Brandon: "I think there’s a distinct possibility that that game will be a later game in the season, but not necessarily the last game of the season. And that’s simply because…I don’t think the coaches, or the players, or the fans, or the networks or anyone, would appreciate that match-up to happen twice within the same seven day period. So, however the divisional alignments occur, and I think we’re getting closer and closer, and I don’t get to make the decision but I get 1/12th of the vote…"
Further. Brandon: "What you’re really going to want is that last game of the regular season to really determine, often times, the championship—who’s going to be the champion of that division and go to the championship game and play for all the marbles. So from a scheduling/timing perspective it’s a new ballgame and although I love playing Ohio State in the last game of the year, I don’t think it’s necessarily a slam dunk that that’s going to continue." I gotta say, I feel a little sad that we won't be ending the year with tOSU. However, based on 2004, 2005, 2006, 2007, 2008 and 2009...I'm a little hesitant to want to play these yokels twice in one season. "I know one thing for sure -- that we're going to play [Michigan] every year," Smith said. "We may end up playing the last game of the year, or not. I just don't know that yet." Smith said his one unshakable objective at the start of the realignment discussion was to assure that Ohio State and Michigan would play every year. There is no danger of that being threatened. Beyond that, Smith said it's wise to let the process play out, step by step, without trying to insist on further requirements. What Smith is alluding to here is a yearly matchup in the regular season definitely happening via a protected crossover game between these two conference powerhouses. This will likely be the case for other conference rivals not in the same divisions. There are some obvious pros to splitting Ohio State and Michigan into two divisions. Penn State could be paired with Ohio State or Michigan instead of Nebraska to keep a 2-2 split with the league's four biggest brands, which I believe is imperative no matter what the Big Ten decides. There could be more of a geographical division split, which many fans seem to want. Michigan and Michigan State could go "West" and be in the same division with Wisconsin, Nebraska, Iowa and Minnesota. An Ohio State-Michigan clash in the Big Ten championship would be huge, regardless of what happened in the first meeting. The big negatives relate to tradition and the importance of the first game. Will it mean as much in mid October as it does in late November? Also, splitting Ohio State and Michigan could actually decrease the number of blockbuster games that could be enhanced through protected crossovers. I'm not going to go all traditionalist and claim this is the end of "The Game" as we know it, but it certainly paints it in a very different light if we're playing Ohio State in early October rather than late November. This idea of a splitting UM and tOSU up hasn't really had time to marinate with me yet. But it seems pretty clear so far, based on the comments from the AD's is that this is going to happen, and there's not much we can do about it...except brace for impact. On the discussion boards I posted what I think is a reasonable solution to the dilemma faced by Big Ten Athletic Directors concerning how to schedule Michigan vs Ohio State every year consistently. Oklahoma Texas is just as big every year and they play it in October.